This initial step shows the potential beginners the band in action — playing entertaining music, showing off the instruments, and having fun. The quality of the performance is not important since students at this level aren’t discriminating, but the impression of playing together and having fun is. The performance can be by any music group or ensemble. The senior high concert or jazz band will work, but the current beginner or intermediate band has the advantage of including students potential beginners will recognize. 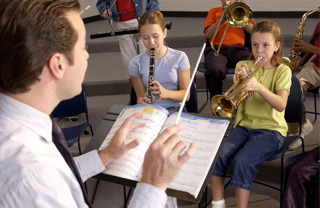 If a school ensemble isn’t possible, invite an area or college group. The performance can be just for the potential beginners or for a larger group of school students. If a larger group will attend, make sure the potential beginners get prominent seating at the front. As the performance begins, introduce yourself and the band. The program should include short, high-energy selections, including a novelty piece or something the potential beginners are familiar with. Arrange for popular or well-known band members to demonstrate each instrument type with a familiar tune. Between numbers, tell the audience about the band, its activities, and its performances. During the concert, mention the upcoming opportunity to join the band, but save the details for after you’ve shown them they could be successful. If there’s time following the performance, allow the potential beginners to mingle informally with the performers. A reception with cookies and sodas can serve as an upbeat conclusion to the event. After the presentation, hang Join the Band flyers in the classrooms, halls, and cafeteria.